After finishing my degree in history and archaeology at the University of Liverpool I was lucky enough to have been one of 14 candidates selected for the Strengthening Our Common life HLF funded traineeship programmes with Cultural Co-operation. I have aspired to become a curator for many years and have now been working at London Transport Museum as a trainee curator for the last 5 months. I am having an amazing experience so far and feel incredibly privileged to work with such an outstanding team looking after a fantastic collection. One of my projects was to curate my first exhibition: this month’s Poster Parade, ‘Moments in Time’. This fantastic selection of handpicked posters documents the Underground at significant moments in its history: the jubilee year in 1913; the 1963 centenary and the 150th anniversary in 2013. Included in this display are ten amazing new posters specially commissioned to mark the Tube150 celebrations. To select only 20 posters from a vast collection of fantastic posters was a very difficult job! However, one of my favourite posters in the display is the newly commissioned RHS Chelsea Flower Show 2013 poster. Now 150 years old, the London Underground can claim a greater pedigree and is also incredibly enduring and popular enabling over a billion people a year to move around London for work and leisure. 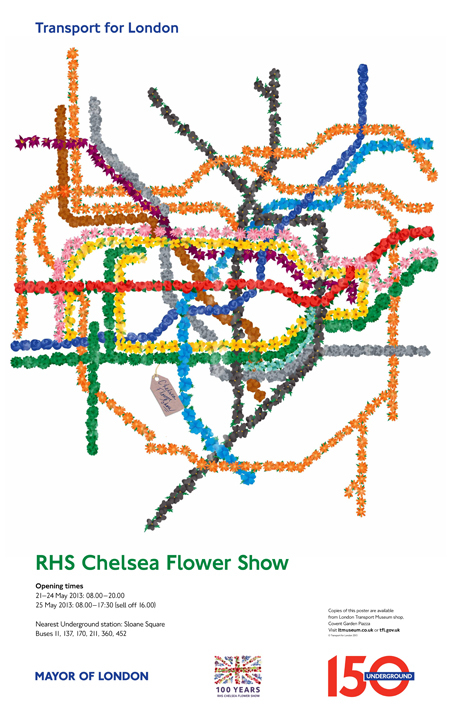 Reviving a great tradition, the Underground in its 150th year publicised the 100th RHS Chelsea Flower Show with a special poster depicting the tube map with its coloured lines as both common and unusual flowers. The poster was devised by the fabulous creative minds at the London Transport Museum’s own Design Studio! A specific flower was chosen to represent each of the different tube lines – a red rose was chosen for the central line and blue tulip for the Piccadilly line. Come along and visit my first curated exhibition at London Transport Museum and see the other 19 fantastic posters that mark the pivotal moments of the London Underground’s history!